This Mount Olympus, not to be confused with the ones in Greece and Utah, is the high-point of the Olympic range in western Washington. 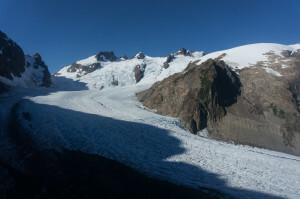 It has something for everyone to dread: climbers are put off by the 18-mile approach, hikers by the glacier crossing. It therefore sees relatively few ascents for a prominent and beautiful peak with good trail access. It had been on my to-do list for a couple of years as an ultra-prominence peak, and since I wanted to dayhike it, I figured I might as well try for the fastest known time (FKT). While I am used to pushing myself in the mountains, by either necessity or habit, I had forgotten the additional pain incurred by a genuine FKT attempt. Other than 12 minutes spent enjoying the summit, and another 5 talking to a friendly woman on the way down, I think this was close to my best effort with current fitness. Between ongoing construction and a large, multi-lobed campground, it took me awhile to find the trailhead at night, but I eventually got that sorted out and hit the trail at 4:45. Running through a dense forest on the west side of the range, I actually needed my headlamp for contrast on the rough trail in the first half-hour. 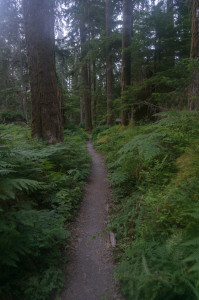 The trail follows the Hoh River for about 10 miles to the Olympus ranger cabin, gaining a measly 500 feet (average 1% grade). The slight grade is enough to be just noticeable while jogging, and is reflected in my splits. Frequent trail signs, and campsites labeled with their mileage from the trailhead, allowed me to keep track of my pace. 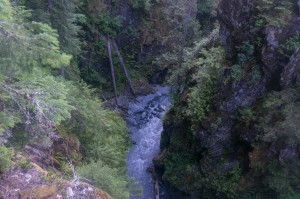 Beyond the ranger cabin, the trail climbs gradually over several miles before crossing the Hoh River at a spectacularly sharp gorge, then climbing more steeply above the runoff streams from the Blue and White Glaciers. Glad for the break from running, I fast-walked my way up the climb, passing campers at the various established spots along the way. I was a bit surprised to learn that many people backpack in for 3-5 days simply to walk to the base of the glacier. 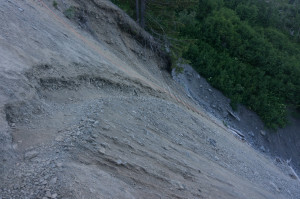 It’s probably for the best, as there is not enough climber traffic to justify maintaining the trail. Shortly before Glacier Meadows, I came upon the famous ladder leading through a large slide chute. I found it surprisingly intimidating in the downward direction, and proceeded slowly until I became accustomed to this strange feature. Returning to the trail, I passed the platform for a seasonal ranger cabin, then continued up the trail to the lateral moraine. From the moraine, I finally got my first view of the Blue Glacier, which I surprisingly found more impressive than most of the Cascades glaciers I have seen over the past two summers. Though it is apparently in rapid retreat, the Blue reminded me more of the glaciers I had seen in Canada, with a low-angle ice plain connected by impressive ice-falls to a striped, meandering valley glacier. The variety and complexity of this ice-landscape makes it seem somehow more impressive than the large but relatively uniform Cascades glaciers like the Challenger, Boston, and Inspiration. Reaching the valley portion, I was glad I had chosen to bring crampons, as there was not enough grit on the surface of the wavy ice cube to make the crossing practical in just running shoes. I hopped from one ridge to the next, aiming for the toe of a rock buttress right of the icefalls. There are no large crevasses on this part of the glacier, but the unevenness makes for slow progress, and I suppose one could jump in a moulin. I was no longer moving at full FKT intensity, but I doubt effort would have translated to speed on this uneven terrain. Doffing crampons on the other side of the glacier, I made my way up some 3rd class slabs to easier class 2 ground, aiming for the highest point of rock below the snow dome. I’m not sure if this is the standard route, but it is definitely the most efficient way to gain and lose elevation while the lower glacier is bare. Returning to the glacier above, I found enough soft snow for crampons to be unnecessary, and did not feel especially insecure without an ice axe. Following and old boot-pack through the “stretch mark” crevasses of the upper glacier, I eyed the more direct routes to the higher western summit, but did not see an obvious line to take through the crevasses and bergschrund with only running shoe crampons. 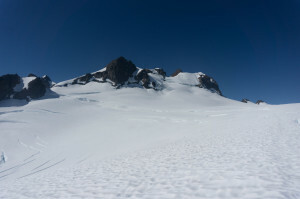 This forced me to the slightly indirect Crystal Pass route, which loops around to the eastern lobe of the glacier and around the back of the summit pinnacle. 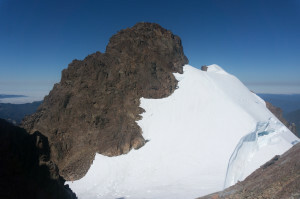 Leaving the snow for a short stretch over the false summit, I downclimbed and slid across a short saddle, then kicked steps up steep snow to the highpoint of the snow below the summit rock, from which hung the usual Pacific Northwest collection of rappel tat. Stepping across onto the rock, I found about a pitch of low 5th class climbing, on steep but surprisingly solid rock with good incut holds. A bit of scrambling later, I reached the summit at 5h35, and knew that unless I imploded, the FKT was in the bag. Even on a full-out effort, it felt criminal not to enjoy the surroundings. 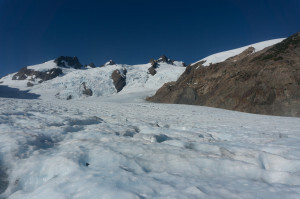 The large Blue and White Glaciers descended from opposite sides of the summit, their outlet streams eventually meeting to the north, with the Hoh Glacier visible farther east. Glaciation in the range is surprisingly concentrated, with relatively little ice visible outside these three large glaciers. 8,000 feet below to the west, east, and north, I could see the fog-covered ocean. Looking through the register while eating my last pop-tarts, I found a surprising number of familiar names, and even a couple dayhikers. I retraced my steps across the false summit, ran down the snow to the rock buttress, then took another extended break to refill my water, wring out my socks, make my fig bars accessible, and pre-emptively ibuprofen my knees. After another crampon session getting across the ice, and an unpleasant slog up onto the lateral moraine, I was finally able to switch into downhill gear for awhile. I passed several groups of glacier sight-seers, stopping for five minutes to talk to an older woman from back east before turning up my pace and music to ignore the rest of the hikers. The descent to the Hoh is intermittently technical, but I was fresh enough to make good downhill time, reaching the Hoh bridge (13 miles to go) at 8h02. On a normal outing, with plenty of daylight left, I would jog as boredom demanded. However this was an FKT, so I aimed for 6MPH for the rest of the day, eating my last ibuprofen and striving for relaxed, sustainable speed. The ranger was awake in his cabin, so I stopped to chat briefly before before grinding out the final 9 miles. Measuring my pace by the campsite mileages, I was pleased to see that I was managing 6 MPH or better. Things started to fall apart with around 5 miles to go, as I no longer had the energy to run the short uphills or maintain speed through rougher trail sections. With 2-3 miles to go, I started noticing slight cramps in my forearm when I adjusted my earbud, a sign I was running low on electrolytes. My knees were definitely feeling it as well, though not in a way that made me worry about acute injury. I reminded myself that it would be over in 30 minutes instead of an hour if I jogged instead of walked, put on some more aggressive music, and passed the final tourist hordes in coma drive, reaching the sign in 10h12. 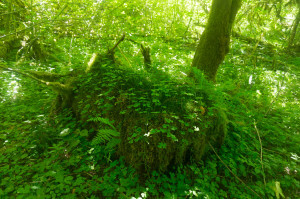 I immediately fetched a gallon jug of water from the car and lay down on some soft moss, carefully arranging my legs to prevent cramping while I rehydrated and cooled down in my thoroughly-soaked t-shirt. Once I felt basically functional, I hobbled back to the car, ate greasy, salty sardines mashed into bread, and drove over to a secluded spot to rinse myself off in the silty Hoh River. 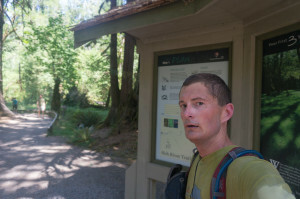 This entry was posted in FKT, Type II fun, Washington. Bookmark the permalink. blown away by your time…. It hurt, but beat camping in a rain forest. What an amazing peak! Also, your assertion about “relatively few assents” is, I guess, relative….. I hadn’t seen that article. The title is somewhat misleading, though: the “risk” is short- and (speculative) long-term minor GI damage from regular ibuprofen use. I haven’t noticed GI problems, but I only take ibuprofen during long runs like this, where pain caused by joint inflammation can slow me down, not as part of my daily “training.” I have heard of people taking mega-doses during races and damaging their kidneys, but haven’t seen evidence that amounts below the maximum recommended daily dose have adverse effects. Is there GPS data for this fkt? No, I’m not sure I even owned a GPS back then. It wouldn’t be much use, anyways, since the best route up the glacier changes constantly. No GPS in 2015!? I was less worried about the route and more interested in seeing your splits. I’d like to attempt this FKT and cannot find any data to support it other than your written report and summarized splits. I’m a bit of a Luddite – I didn’t even have a smartphone until last fall. I may have bought a GPS that year, but didn’t think to bring it. The campgrounds are all signed by mileage, which makes pacing easy. As for verification, photos are harder to fake than a GPX file (which is just simple text), and I want to take them anyways. I would probably bring a satellite tracker if I were to try for one of the “big” FKTs like the JMT or Nolan’s, where there’s potential money and media. I get nothing for my FKTs besides satisfaction and respect from a handful of mountain speed enthusiasts. I think reputation and trust should be enough, and prefer that to satellite tracking and suspicion. Anyways, good luck with the FKT. You can probably outrun me on the trail; the tricky part is route-finding and glacier travel with minimal gear. And don’t forget to look around. The Blue Glacier is truly unique in the lower 48. Thanks man! That will definitely be my weakness whereas the trail would be my strength. Still, with that being said your climb from hoh bridge to glacier meadows seems super human! What did you have for breakfast? Curious, do your digital pictures have a time stamp? I believe the standard EXIF data includes a time stamp, which you should be able to see using your favorite photo viewer. I often use photo times to remember splits. I doubt I was climbing more than 3000 ft/ hr, which is not bad, but well below what the pros can do. Do you have a picture at the start? Hoh Visitor Center? I have a photo of the trail sign (titled “Step 1. Plan”) at 4:44:47 AM. The shot of me in front of that same sign at the end is 2:57:17 PM. How come the “step 1. Plan” photo didn’t make it in the trip report? Because it’s a boring flash photo of a sign, that I only took for my own timing purposes. Like other outings, I took a lot more photos that day than made it into the report. Well didn’t you want to put it up so it’s easier to verify your time? If photos are the only solid verification wouldn’t you want that verification to be complete on your trip report. Rather than someone having doubt and thinking you started at an earlier time and took it easy to the Ranger Cabin and then started moving at FKT pace? Sean, this is incredible! Thanks for the amazing trip report and for setting an absurdly high bar for future attempts. I think I’ll give this run a go this summer, as I’ve climbed it slowly in the past and find the idea of running this mountain rather liberating. Odds are I’ll get nowhere near your time, but let me know if you’d like to join, of course! Out of curiosity, I was wondering what kind of shoes / pack you were using? I’m on the market for both, so I figured I’d ask the expert of my main summer objective! Thanks! Jeremy A. almost beat my time last year, and I’ll bet either he or another fast local runner will beat it this summer. 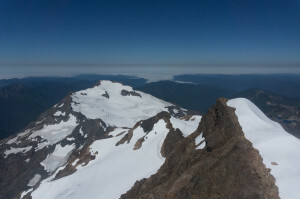 I unfortunately won’t be visiting the PNW this summer, as I have already made plans elsewhere, but it’s cool to see more people getting inspired to run these remote peaks, and I look forward to seeing how it goes for you. Pack-wise, I think I was using an REI Flash 18, which was cheap and about the right size. If money were no object, I’d probably use an Osprey Duro 15 now. Basically, you want food stash pockets, enough room to carry crampons, and at least 2l water, since the section along the Hoh is hot and long, with no easy and obviously clean water source. I don’t remember what shoes I used, but they were something luggy, like LS Mutants, Salomon Speed Crosses, or one of the Adidas Terrex shoes. They are useful for the mud down low, and make it possible to cross the upper glacier without crampon transitions. I did not carry an ice axe; this worked out okay on a warm day, but could have been problematic. Olympus is a wonderful mountain — good luck and have fun! Thanks for the fast and incredibly helpful reply! Your shoe advice makes good sense, as do your pack recommendations. I am so excited to move fast on this amazing mountain.